Two main variables that change during transient power load are: area frequency and tie line power interchange. The concept of Load Frequency Control (LFC) is directly related to the aforementioned variables since the task is to minimize this variation. The key thing is to maintain the steady state at null position. In this vein, effective measures like Active Disturbance Rejection Control (ADRC) have been developed that allow practical control. The main bifurcation between frequency and voltage in power system is on the account of active and reactive power. The dependency of frequency is on active power whereas that of voltage is on the reactive power. The combination of active power and frequency control is generally known as Load Frequency Control. The role of tie-lines can be understood from the construction of a large power system. 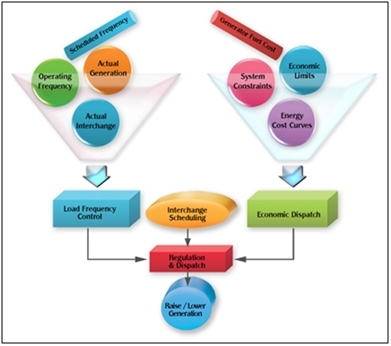 Power System has several generating units in which the notion of fault/load tolerance has to be enhanced. For this purpose tie-lines are made between these interconnected units. Owing to the introduction of tie lines, the controller has also got to deal with tie line power exchange error. There is a need to have a unique load frequency controller for each area. This is because the interconnected system has to set their set-points in a different manner. With more interconnectedness of the system, the complexity would also increase in terms of the tuning controller parameters. In such cases, when the controllers are being designed, all approximations have to be included in the parameters. These purposes have been generalized to accommodate a number of tasks that are performed by LFC. However one way or the other they are linked to the three main purposes. The objectives can be understood better in terms of solutions that have been explained next. We have the concept of a decentralized power system where compartmentalization subsystems are created to keep the tie line disturbances in check. One such technique is that of decentralized PI or the Proportional Integral Derivative (PID). PID: This basically caters to the issue of decentralized LFC cases. This is a robust system and tackles ambiguities well enough through it multiple controls like disturbance accommodation and ramp following. In addition to this, it also has a predictive control scheme and an optimal tracking approach as well. Genetic Algorithm (GA): This particular control technique is a depiction of one of the best kind of computer intelligence in power systems. Different research designs have approved of the GA where it was used along with PI type controllers. Using linear matrix inequalities (GALMI), GA has been able to solve complex optimization problems. The main difference in the functionality of GA and PID is that the latter one uses a H2/H∞ controller. Active disturbance rejection control (ADRC): This particular control technique has been modified over time and is a popular one in terms of practicality. In terms of design, the main parameters of focus in ADRC are the input and the output. This simply means that in order to perform its control tasks, the main information is analyzed from the input and output portions of the power system. The name of this controller is also able to depict its function too. ADRC is able to detect the disturbance in the real system and also able to reject it. One of the main reasons for the general popularity of ADRC is its practicality. In this particular case, no additional information is needed like the precise model information. In this manner, its activity is very directed and efficient against the uncertainty or any external disturbance in the system. Work is also being done on the enhanced activity of ADRC where area control error responses can be made faster. There is a need to find the correct balance between the “control” effect of ADRC and optimal ACE response. In this post we have reviewed various aspects of LFC and how they are relevant in a power system. Furthermore, different controllers have been discussed with their mode of operation. One thing that is needed to be pointed out here is the fact that in research being done on LFC, at times, some plant limits are omitted. Because of this, the practicality of controllers could be hindered on a large scale usage. We have discussed about ADRC. It is also possible to regulate the control effort and response cycle by tuning the ESO and state feedback controller. Additional research is still needed to be done to develop a quantitative method for determining control parameters in the case of ADRC. This is where the application of genetic algorithms comes in. This article is a request from the community. Did you have enough information? or copy this trackback: http://engineering.electrical-equipment.org/power-quality/load-frequency-control-lfc.html/trackback from your own site.